Recent advances in light-emitting diode or LED technology have caught the attention of leading cannabis cultivators. Now you can grow better cannabis with LED lights. Recent advances in light-emitting diode or LED technology have caught the attention of leading cannabis cultivators. The lights create energy savings while producing better cannabis, making them ideal for large-scale grows or smaller home grows. If you are considering starting a new grow or replacing the lights in your current setup, you will want to check this out! To understand the power of LED we must first explore what indoor cannabis cultivators traditionally use. Cultivators generally use a combination of 2 types of lighting. For the vegetative stage of growth they will use metal halide bulbs that have blue spectral energy crucial for vegetative growth. 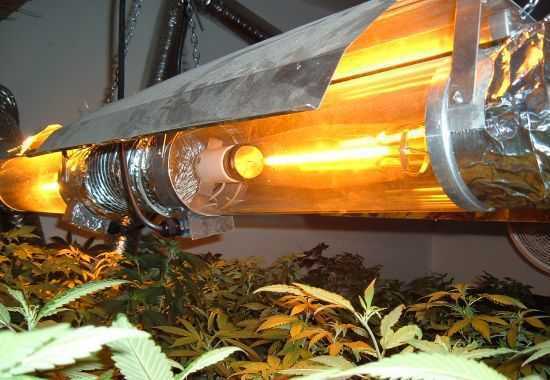 Then during the flowering phase of the plant, cultivators will typically switch to high-pressure sodium or HPS bulbs. The HPS bulbs have an orange tint to them that provides the red spectral energy that induces flowering. This technique is commonly used, but there are inefficiencies galore. First of all, the metal halide and HPS bulbs consume a lot of energy. These bulbs directly pull more energy to operate, but they also require ventilation that requires additional equipment and energy use. Further, the bulbs lose their effectiveness quickly, reducing their light spread and subsequently forcing the plants to work harder to get the light they need. If only there was another option that saved you time and money while producing better cannabis. LED lights have been around for 53 years, but they did not emerge as a viable indoor gardening option until recently. LED lights have always produced the green and red light spectrum, but they lacked the crucial blue light emitting diodes that are crucial for vegetative growth. Last year, the Nobel Prize for physics was awarded to Isamu Akasaki, Hiroshi Amano and Shuji Nakamura for successfully creating LED lights that use the blue light diode to emit a white light. Finally solving the problem for gardening as well as general lighting needs. Now, cannabis cultivators can purchase an LED light setup and eliminate the need to change bulbs, purchase additional ventilation, or worry about the lights losing their strength. Additionally, LED lights will use 60-90% less energy than HPS bulbs, saving a ton in electric bills. Watch out for low-quality LED lights, they won’t save you time or money. In order to achieve optimal results, you must be sure to purchase LED lights that are capable of producing a light spectrum strong enough to penetrate the canopy of your crop. Lights like the Heliospectra LX60 claim to produce industry standard yields and a reduced seed to harvest time. On average, HPS lights achieve a yield of .5 grams per watt. For comparison, LED lights usually achieve 1g to 1.5g per watt, making them up to three times more effective. LED lights have a lifespan of up to 100,000 hours while HPS lights begin to lose their effectiveness after 2-3,000 hours and are only expected to last 10,000 hours. LED lights are versatile. Because of their low heat emission, LED lights can be positioned close to the plant canopy. This gives you the ability to control light spread. HPS lights convert more of their energy use to heat than they do light. So it is important to keep them a safe distance from the plants at all times to avoid burning the leaves. A single LED light setup will cost on average $1,500, but projections show that this cost should be cut in half by 2020. If you are just entering the marijuana cultivation world, I would suggest learning to grow with LED. Don’t worry this isn’t a fad; LED lights are here to stay. As more people experiment with LED, the results will inevitably lead to better cannabis. Check out this video to see how LED grown cannabis compares to HPS. Will you be trying LEDs to grow better cannabis? Let us know on social media.